Sometimes it happens all at once. After 12 years and almost as many votes of confidence, one day a coach can wake up and everything he's accomplished means nothing, all his team's promise is tacitly promised to his successor. Philadelphia fans woke up today and checked both their national and local sports news. In both places, right on the front page where they and the rest of the country and Joe Banner and Jeffrey Lurie couldn't possibly miss it, are the surest signs that Reid's green days are numbered. "Blame Andy Reid" goes one headline; "Time to bid Reid bye-bye?" asks the other, the inessential question mark a newspaper's sop to impartiality. Losing by a single score to a 4-1 team doesn't usually sound the call for rolling heads. But in yesterday's loss at Buffalo, the culprits were three serial killers: Reid's clock management (the Eagles bungled their way out of any points at the end of the first half), Reid's lack of discipline (five turnovers, Juqua Parker's inexcusable offsides penalty on 4th-and-1), and Reid's inexplicable loyalty (after 13 years as an offensive line coach on a team without a particularly great offensive line, Juan Castillo was moved to defensive coordinator, and the Eagles still cannot tackle). Every Philadelphian is a sports talk radio caller today—"I could coach this team better"—and when you're making the same mistakes that everyone predicted out before the game started, your divine mandate has been rescinded. But losing the fans is one thing, and not a new one. ("Fire Andy" has been a common refrain on message boards for many years, almost as common as "Trade Donovan" for most of them.) This year, this week, this morning, Andy Reid lost the media. It's not known as widely as it should be, but Reid "had" the media in the same sense that Kim Jong-Il does—through fear and threat. His press conferences are charades of ignored questions and refused answers. In violation of NFL rules, he refuses to make his assistant coaches available after games. Should a writer be critical of the team in a non-team-approved fashion, he's out. When former Inquirer writer John Gonzalez moved to CSNPhilly.com over the summer, the Eagles approached Comcast and made clear they didn't want Gonzo covering the Eagles in any fashion. Left unsaid: do it or all of CSN's access will suffer. So Gonzalez is off the Eagles beat, and the only person who'd even report the bullying was a gossip columnist. Not for nothing, today's two Reid-bashing pieces came from a national writer and a columnist, folks who don't have to worry about being banned from the locker room. It's not surprising Reid's survived this long. He's a good coach, whose teams have won more often than not. His players love his act, since it shields them. ("There's nobody to blame but me," he said yesterday.) And through none of his own doing, he himself was shielded for many years by a more public face of the organization: Donovan McNabb. 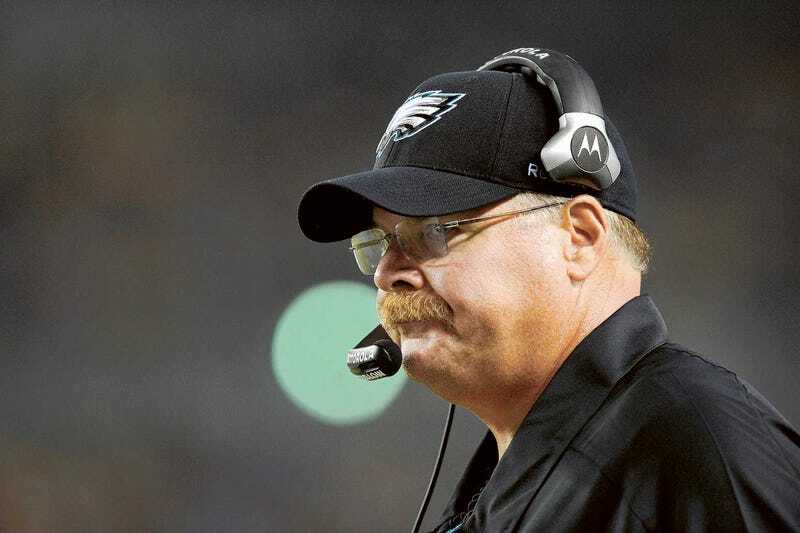 McNabb was the Andy Reid of quarterbacking. Good, sometimes great, could have been even better. Being the field general, he naturally took the lion's share of the criticism. Whenever the Eagles were eliminated, the debate would begin anew: someone's got to go, but which one? The Eagles made the prudent decision shipping out McNabb, who had passed his physical prime. But was it folly to think that Reid was ever going to change his ways? To find out once and for all, the Eagles braintrust brought in a test and an ultimatum in the form of Michael Vick and his huge contract. In McNabb's later years in Philly, his contract was an annual restructuring. If one had to go between Reid and McNabb, financial considerations wouldn't matter. Now they do: Vick is Philadelphia's for five years if they want him, and they've already sunk $35 million in guaranteed money. Reid's deal is up in 2013, at roughly $5 million a year. Now financial considerations make Reid the expendable one, and competitive considerations too: a franchise quarterback is rarer than a competent head coach. This time, if the hyped-to-the-moon Eagles miss the playoffs and somebody has to take the fall, it won't be the quarterback. Once upon a time, Andy Reid used the carrot: a series of deep playoff runs. In recent years it's been all stick, intimidation to keep public criticism off the agenda. The stick can only work for so long before the subjects have had enough.